Ah Spring. 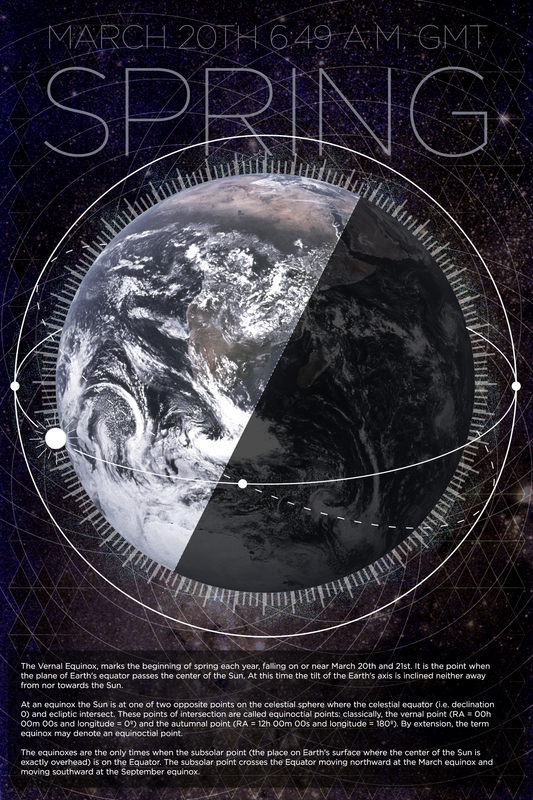 The Vernal Equinox Begins At 6:49 A.M. GMT. It’s been a long, nasty, cold, snowy, can’t wait for you to end kind of winter here in the midwest and elsewhere. The good news is the first day of Spring starts at 6:49 A.M. Greenwich Mean Time. If you want to know where you are in the world, in relation to GMT, click here. I created the image below to give you a few facts about the equinox, but if you don’t care to bend your noodle with science here’s the short sweet version. Tomorrow the Sun passes directly over the equator so day and night are equal in length. (That’s 12 hours each if you are feeling really lazy) Starting tomorrow the days get longer until the Summer solstice around June 21st. With the longer days, the Northern Hemisphere gets warmer. Warmer temps mean less snow and ice. Posted in Design and Art, Science and tagged Daylight, Design, Earth, Equinoctial Points, Equinox, Graphic Design, Science, Spring, Subsolar Point, Summer, Sun, Vernal Equinox, Winter 2013/2014 on March 19, 2014 by Author.